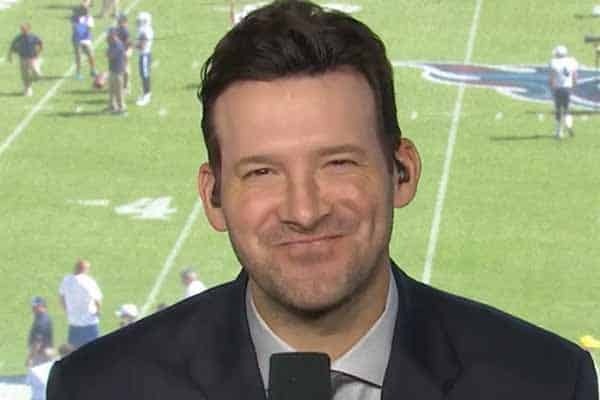 After another season of accurately calling NFL plays before they happen from the CBS booth, Tony Romo—who has become the modern day Nostradamus of sports broadcasting—blessed us with his prediction for the final score of the Rams-Patriots matchup in Super Bowl LIII in front of a crowd of reporters during a media event on Tuesday. The crowd of reporters responded in awe, filling the room with “oohs” and “aahs.” You’d almost expect a chat of “All hail Romostradamus!” to break out any given second. Praise be!—But if you were looking to base your Super Bowl LIII bet solely on who Tony Romo will pick, then sorry NFL bettors, he’s chosen not to completely spoil the 53rd installment of the Super Bowl and we mustn’t be greedy. After all, he’s giving us the total points (52) for the over/under, which would fall under the current total (57) set by Bovada and the total (56.5) at BetOnline. His margin of victory is favorable to the Patriots since a win by 4 points covers the Patriots -3.0 and -2.5 spread at the two online sportsbooks, respectively. And when analyzing the second of half of his prophecy “And I think the team who has 24 has the ball at the end, and they don’t score,” it’s possible to take that a few different ways, but there’s one that sticks out. It seems like the most plausible occurrence would be that Tom Brady, who’s sort of known by now for his comebacks in the final two minutes, leads the Patriots (who are down 24-21 at this point) on a touchdown-scoring drive within the 2-minute warning and leaves very little time on the clock for Jared Goff and the Rams to mount a comeback, giving the Patriots the win 28-24 in Super Bowl LIII. Or it could go vice versa for the Rams—who really knows? Or have you not been paying attention to the revolutionary commentary by the former Dallas Cowboys quarterback over the past two seasons? But if you’re still in doubt, then check out his fortune-telling prowess on display during this year’s AFC Championship between the Patriots and Chiefs, courtesy of YouTuber Close Look. Finally, you know it’s a big deal when the oddsmakers have taken note of your ability to accurately predict the outcome of something. Here are all the prop bets on Tony Romo when he analyzes and calls Super Bowl LIII on Sunday, Feb 3. Bovada: How Many Plays Will Tony Romo Correctly Predict Ahead Of The Play? Bovada: What will Tony Romo be doing at the start of the 2019 NFL season? Bovada: Will the CBS Broadcast mention the point spread or total during the game? BetOnline: How many times will Tony Romo say “Here We Go”? BetOnline: Will “Romostradamus” be said during the live broadcast? BetOnline: Will Jim Nantz or Tony Romo mention the point spread on the game?